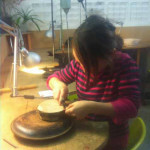 Jewellery Workshop for the Family – Textures on Metal: Sunday Afternoon Course. – This family jewellery workshop is an exciting opportunity for you and your child to make fabulous jewellery and other objects in metal. We explore the unique characteristics of this material, with focus on metal manipulation techniques. Learn how to add texture to metal. Punch letters, or imprint leaves or feathers onto copper sheet. Use hammers to create interesting patterns. Then cut and shape your results to make earrings, a bangle, pendant or a medal. Or you could also make a very special star for your Christmas tree! At Flux Studios we provide a supportive environment where families / children and their carers can actively engage with creative and craft processes in the professional environment of an artist studio. We design our courses to inspire creativity in children and adults alike. Hence we tailor projects to suit children and adults having no prior experience, with initial focus on free experimentation with material and technique. Students then put their newfound experiences into producing a final piece of jewellery or mini – sculpture. *If you live in Southwark and have not booked a course with us since September 2018, this course is free. A fully refundable £10 deposit is required to book your place. **Please note, we give preference to residents of SE5 and Southwark, since this course is part funded by Southwark Community Learning. In the event that you book a place but we can’t offer it to you we will refund your payment.